Have you ever encountered an error message while working on Microsoft Outlook? 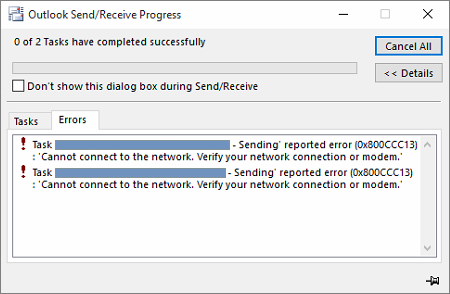 Generally, error messages cause Outlook to crash or stop responding. And sometimes errors can also lead to file corruption if don’t get resolved in time. 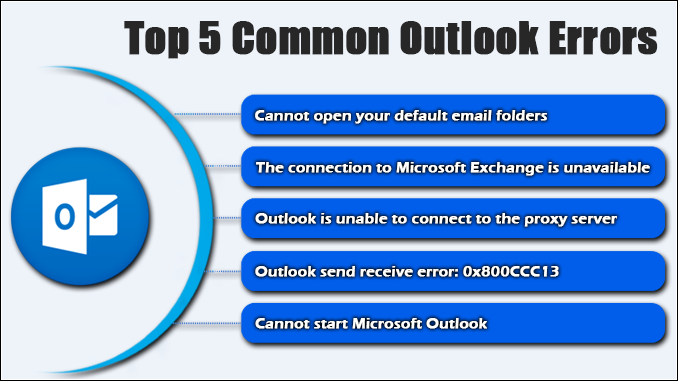 In this article, we’re going to discuss the top 5 common Outlook error messages. Also, we’ll learn how to fix those errors effortlessly. Microsoft Outlook is a popular email client application used globally for sending and receiving email messages. Apart from being an email application, it has versatile features like create meetings, appointments, tasks, notes, and much more. However, problems in Microsoft Outlook is certain to happen not only because of the failure of application but also due to software malfunction. Or, remove the MSN/Hotmail account from your mail profile if you don’t wish to use it anymore. First, enable the add-in manually. Now reinstall the Outlook Hotmail Connector on your system. And then remove the MSN/Hotmail account from the Outlook client. Restart Microsoft Outlook and add the MSN/Hotmail account again by using the Outlook Hotmail Connector menu. Once the account has been successfully created, repair the Office installation. Once it’s done, recreate your mail profile. Maybe there’s no data connection available at the very moment. So you should start by using the Telnet protocol to test your SMTP connection. If you don’t how to do that, you should take help of this guide published on the Microsoft TechNet site: Test SMTP with Telnet. It may happen that the Outlook data files, i.e. PST and OST files, are accidentally locked, and you have no idea about that. Or maybe the Outlook data files are set to the read-only status. You should better check the permissions of these files, and make sure neither is set to the read-only status. There are many 3rd party applications which can interfere with Outlook while it’s being connected to the Exchange Server. If this is the real cause, you should better start Outlook in safe mode. A certification authority is required to connect to the server. Maybe you forgot to trust the certification authority at the root. The certificate seems to be invalid or canceled. The site’s name ain’t matching with the certificate. Maybe a 3rd party add-in or browser is causing this error. First, connect to the RPC Server or to the secure server in Microsoft Internet Explorer. Type https://www.server_name.com/rpc in the address bar, and hit Enter. Now double-click the padlock icon located in the lower-right corner of the web browser. This field indicates the date until which the certificate is valid. Make sure this field should match the site name. On the Certificate dialog box, click Install Certificate > Next. Now check the Place all certificate in the following store box. Then click Browse. Now click Next > Finish > OK.
Before you can actually disable any 3rd party add-in, you should start Outlook in safe mode. Simply press Win + R to go to the Run command prompt. Type Outlook.exe/safe in the edit box, and hit Enter. If Outlook starts in safe mode without any problem, this means the real problem is associated with the 3rd party add-ins. Here you need to check for the 3rd party COM add-ins and disable them. First, launch Microsoft Outlook. On the taskbar, click the File tab > Options > Add-ins. Click COM Add-ins in the Manage box, and then click Go. Clear the checkboxes shown next to the 3rd party add-ins which you want to disable. Important note: Remember, Outlook uses the Internet Explorer settings for HTTPS requests. If a 3rd party browser add-in is causing this issue, you should try to disable it in the Internet Explorer. This is the most common Outlook error which can occur in any edition of Microsoft Outlook whether it’s 2016, 2013, 2010, 2007, 2003, etc. Generally, this error message occurs after upgrading Windows 7 or 8 to Windows 10. Those users who’ve recently upgraded to Windows 10 are more likely to come across this common Outlook error. You’re using Windows 10 Enterprise and Pro 1511 (Build 10586) or any higher version. And for Windows home, you should have version 10 (10240) or any higher. But if you’re still receiving this Outlook Send Receive error, maybe the system files are corrupted and you need to repair them. You can use the Windows System File Checker to repair corrupted files. Now right-click the Start in Windows and select Command Prompt (Admin). Note: If you don’t see the option, you can choose Windows PowerShell (Admin). Type sfc /scannow in the command prompt. This process may take around 20 minutes to scan a regular hard disk. Please wait until the process completes. Once the process is successfully completed, restart your computer and open Microsoft Outlook. Note: If you see the XML file size is 0 KB, it’s a strong indication of corruption. Now type Outlook.exe /resetnavpane in the edit box, and hit Enter. Make sure that Microsoft Outlook ain’t running in compatibility mode. Remember that Microsoft Outlook may not start if you’re using an old profile of any older Outlook version. Make sure you’ve created a new Outlook profile and using it. Installing and reinstalling Microsoft Outlook more than often can also cause this error if done improperly. And most importantly, if you have a corrupted Outlook data file, you’re likely to receive this error. You can use the scanpst utility to repair PST file. Generally a corrupted PST file is considered the main cause behind most of the common Outlook error messages. Although Microsoft provides the Inbox Repair tool to repair PST file, it may fail or not work in a case of severe corruption. In such a crucial situation, the PST Repair tool from Shoviv Software is the most reliable solution in the online marketplace. It can successfully scan corrupt PST file and fix all the error messages with almost no manual effort. Via this software, you can repair PST file and restore all your mailbox data into a new file. I strongly recommend users to download its demo version for free evaluation. If we don’t fix the Outlook errors in time, we’re likely to face severe problems sooner or later. In this article, we’ve discussed the top 4 most common Outlook error messages. Also, we’ve learned how to troubleshoot those errors in the most effective way possible.